Welcome to our new H2O ORCA series visual product configurator! With this short guide we would like to give you some information about our new H2O ORCA product configurator and also some hints to improve your configuration experience. This H2O ORCA visual product configurator project started at the end of 2014 and took more than 5 months to complete. With over 800 different renderings these six H2O ORCA configurator were very time consuming to create and especially the required, complex logig with several in- and exclusions was a challenge for us. We hope the result, the H2O ORCA visual product configurator, will give a a better impression how your individual watch will look at the end. The Microsoft Internet Explorer is not supported. Important: Mobile devices, like tablets or mobile phones, may work well, but have often difficulties to display the graphical content in the right way due to high data transfer volume and high resolution of the images. The very different hardware and software of the mobile devices makes it impossible for us to create our visual configurator to be compatible with them. Therefore we don´t recommend the use of mobile devices. Please use your stationary Personal Computer or Macintos with the latest version of the Mozilla Firefox, Google Chrome or Apple Safari browser. Open the H2O ORCA visual configurator and wait until all required images are loaded and displayed. In case the display of the visual configurator is not correct, please reload the page again and maybe even clear the browser cache before. Always start your configuration with the first step and follow the watch configuration through all possible steps until the end. 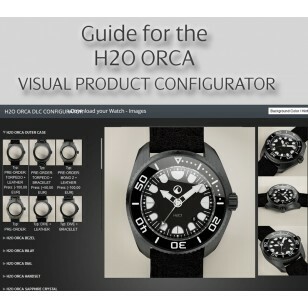 During the configuration of the H2O ORCA watches a huge amount of data and images (up to 50MB for the H2O ORCA watch configurator) will be loaded. When a new option was chosen the configurator will download the required images. All 4 product views should be correctly displayed before jumping to the next product option. Before finally placing your order please check inside the shopping cart that the configuration was correctly and successfully taken over from the visual product configurator. The visual product configurator is downloading a huge amount of data and images for a single session. In case several customers are working simultaneously with the visual configurator it may happen that the data transfer to your session is slowing down. Sometimes there are more options available than could be displayed at same time. 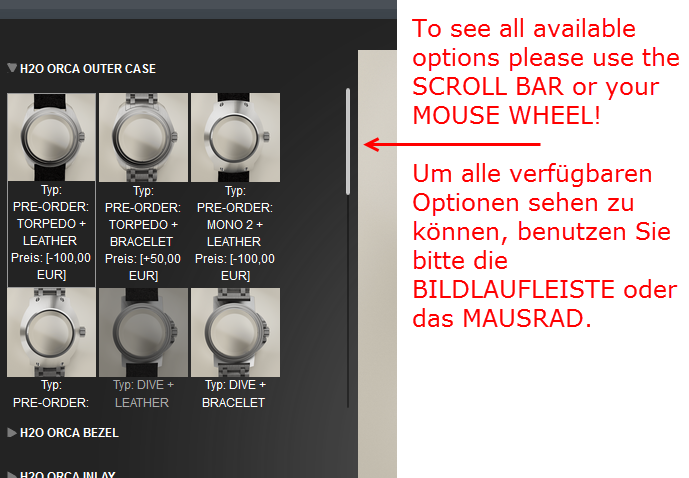 Please use the scroll bar or your mouse wheel to see all available options.